Duplications of the alimentary tract are rare developmental abnormalities. They can be observed anywhere along the alimentary tract, and they are located most often in the ileum and least often in the duodenum. Duodenal duplication constitutes 5%–7% of all gastrointestinal duplications. The clinical features of the duodenal duplication may vary from asymptomatic to symptoms such as abdominal pain, abdominal distension, and vomiting. Patients may develop symptoms of gastric outlet obstruction or small bowel obstruction. Ulceration or perforation due to the presence of an ectopic mucosa may cause duodenal bleeding or peritonitis, respectively. It may present as recurrent pancreatitis due to direct pressure over the pancreatic duct, stone formation in cyst due to stasis, jaundice and intussusception, and hemorrhagic ascites. 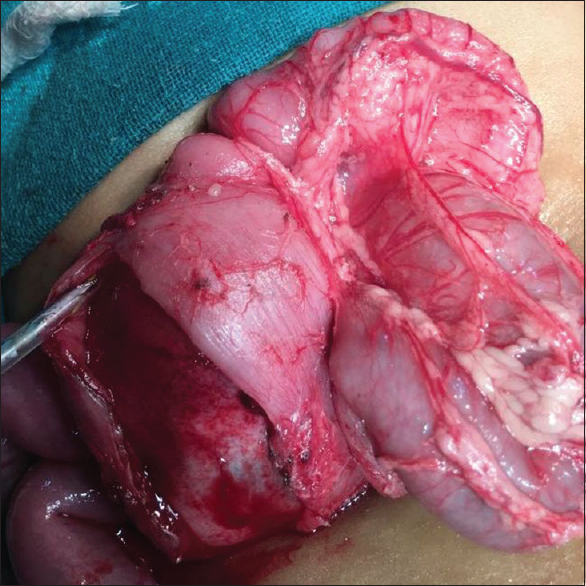 We are presenting here a case of huge duodenal duplication in a 3-month-old male child, presented to us with the complaint of bilious vomiting with a palpable lump abdomen. Parents of a 3-month-old male child presented to us with complaints of bilious vomiting with palpable lump abdomen for the past 5 days. There was also history of the intermittent episodes of nonbilious vomiting which were relieved by medications locally. On examination, the abdomen was soft with palpable lump in the right hypochondrium. Routine blood investigations were within normal limits. Ultrasound abdomen revealed a 52 mm × 33 mm size double-layered anechoic cystic lesion with echoes adjacent to the second part of the duodenum, causing compression on the duodenum. Contrast-enhanced computed tomography (CECT) abdomen revealed a well-defined cystic hypodense lesion (42 × 35 × 47) noted abutting the second part of the duodenum and anterior part of the right kidney [Figure 1]. It was causing the compression of the second part of the duodenum with mild distension of the duodenum. Both ultrasound sonography abdomen and CECT abdomen were suggestive isolated duodenal duplication cyst in the second part of the duodenum on the mesenteric border. The lumen did not connect with the duodenum. We explored the patient; huge duodenal duplication was present in the second part of the duodenum [Figure 2]. Due to proximity with the other structure, partial excision with internal deviation was done. The patient was discharged uneventfully after 7 days. 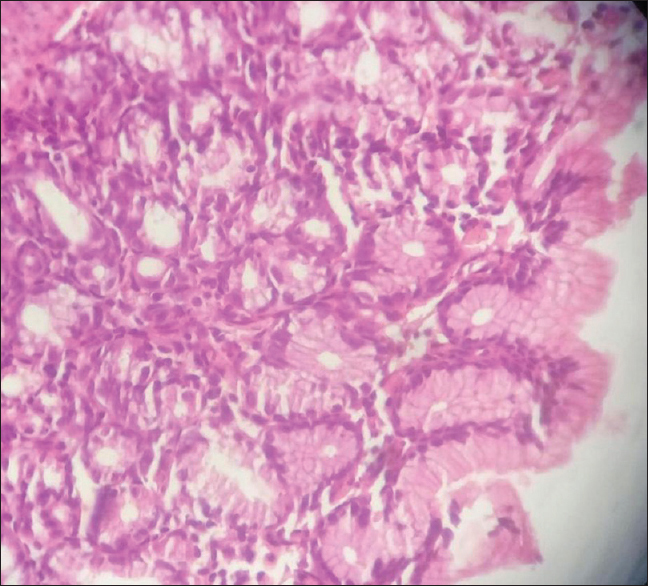 Histopathology report showed duodenal duplication with the ectopic gastric mucosa [Figure 3]. Gastrointestinal tract duplication is a congenital abnormality. It has well-developed smooth muscle lining. The epithelial lining represents some portion of the alimentary tract. It has equal incidences among males and females. They may be single or multiple and usually found along the first and second portions of the duodenum on its mesenteric side on the anterior wall. The blood supply is usually associated with that of the duodenum so that surgical dissection of the duplication from the duodenum is often impossible. Communication with the main lumen is rare. Communication with the pancreaticobiliary ductal system has also been reported. They are lined by mucosa, usually similar to that of the duodenum, but ectopic gastric (15%), small intestinal, and pancreatic mucosae have has also been reported. Outer lining is one or more layer of smooth muscle. Peristaltic movements may be present. Contents may be mucilaginous, mucoid or watery, and clear or reddish brown in color. It can be associated with other congenital anomalies such as double gallbladder, congenital dislocation of the hip, ventricular septal defect, patent ductus arteriosus, ileal and gastric duplications, and mediastinal and esophageal cysts, while in our case, it was isolated duodenal duplication. Duodenal duplication can be cystic or tubular, communicating or noncommunicating, but the most common type is cystic and noncommunicating. In our case, it was cystic, noncommunicating, and located in the second part of the duodenum. It is usually diagnosed in infancy and childhood. However, many patients can remain asymptomatic until adulthood. The preoperative diagnosis of intestinal duplications is rarely accurate. In barium studies, in noncommunicating cysts, the first and the second parts of the duodenum can be seen as compressed and displaced by a mass, whereas in the communicating type, the cyst itself can be observed as being filled with barium. Duodenal duplication is differentiated from other cystic lesions by the “gut signature” of its wall observed by abdominal or endoscopic ultrasound. Gut signature refers to the layered pattern of the wall, with the hyperechoic inner layer representing the submucosa and the hypoechoic outer layer representing the smooth muscle. Peristalsis of the cyst wall noted on real-time ultrasound is strongly suggestive of a duplication cyst. CT is valuable in identifying the type, location, and size of the duplication cyst. Magnetic resonance imaging and gastroduodenoscopy are the other modalities that can be used for diagnosis. In spite of the diagnostic workup performed before the operation, accurate diagnosis of duodenal duplication is by histological examination. According to the analysis made by Uzun et al., two types of intra- or juxta-duodenal duplications occur: (1) a common wall formed by two separate mucosae with their own muscularis mucosa and a layer of intervening connective tissue and (2) a common wall that comprises two mucosal layers with two smooth muscle layers but that also contains biliary and pancreatic ducts. Prenatal diagnosis has been reported from 20 weeks of pregnancy, allowing the medical team to plan in advance an early postnatal treatment. The isolated cyst can be managed conservatively. Surgical management is required based on symptoms and complications (obstruction or bleeding). If the distal biliary and pancreatic ducts are not traveling through the common wall between the duplication cyst and duodenum, endoscopic treatment with duodenocystostomy is favored as a less invasive procedure. If located in the common wall, then laparotomy or laparoscopic exploration is recommended, and the technique includes duodenotomy and then duodenocystostomy or fenestration of the cyst. Total excision is an optimal approach. However, if the lesion occurs closed to the pancreaticobiliary tract, performing the total excision is difficult and risky, and then, partial resection or internal derivation must be carried out. In partial resection, the entire cyst wall is removed wherever possible while the area of maximum adherence to the duodenum is preserved.,, Recently, endoscopic fenestration has been reported. Duodenal duplication has the possibility to become malignant. In some cases, carcinoid tumor was found in the wall of the duplication cyst. it can be treated endoscopically, but it relieve only symptoms without excising the lesion. in future there is chance to turn in malignancy. Therefore, we treated our patient with subtotal excision and internal derivation, which cured the patient. Histologically, duodenal cysts have all layers of the intestinal wall, but in few cases, they can present ectopic gastric and pancreatic mucosa, which might be related to local bleeding before or after the surgical treatment. Complete resection of the cyst or mucosal stripping are indicated because of the possibility of the malignancy from the ectopic tissues and chronic inflammation of the mucosa.,,, We also did mucosal stripping. Nowadays, after diagnosis and if surgery is indicated, laparoscopic treatment should be considered in the first place with the possibility of resection or duodenocystostomy and mucosal stripping if technically possible, though the chances of future malignancies are noted in one report only. Resection of the duodenal segment and Roux-en-Y anastomosis should be reserved for cases in which there was an extremely distorted anatomy, and biliary ducts were injured during endoscopic or surgical treatment. Duodenal duplication should be considered in the differential diagnosis of a patient who presents with vomiting and abdominal symptoms, especially when cystic structures neighboring the duodenum are demonstrated radiologically. Ideal treatment is total excision but, if not possible, subtotal excision and/or internal derivation should be performed. When treated properly, these lesions usually have favorable outcomes. Uzun MA, Koksal N, Kayahan M, Celik A, Kilicoglu G, Ozkara S, et al. Arare case of duodenal duplication treated surgically. World J Gastroenterol 2009;15:882-4. Shaheen O, Sara S, Safadi MF, Alsaid B. Duplication cyst in the third part of the duodenum presenting with gastric outlet obstruction and severe weight loss. Case Rep Surg 2015;2015:749085. Chen JJ, Lee HC, Yeung CY, Chan WT, Jiang CB, Sheu JC, et al. Meta-analysis: The clinical features of the duodenal duplication cyst. J Pediatr Surg 2010;45:1598-606. Prasad TR, Tan CE. Duodenal duplication cyst communicating with an aberrant pancreatic duct. Pediatr Surg Int 2005;21:320-2. Macpherson RI. Gastrointestinal tract duplications: Clinical, pathologic, etiologic, and radiologic considerations. Radiographics 1993;13:1063-80. Faegenburg D, Bosnaiak M. Duodenal anomalies in the adult. Am J Roentgenol Radium Ther Nucl Med 1962;88:642-57. Barr LL, Hayden CK Jr., Stansberry SD, Swischuk LE. Enteric duplication cysts in children: Are their ultrasonographic wall characteristics diagnostic? Pediatr Radiol 1990;20:326-8. Rotondo A, Scialpi M, Pellegrino G, Salzano De Luna F, Coppola L, Angelelli G, et al. Duodenal duplication cyst: MR imaging appearance. Eur Radiol 1999;9:890-3. Tsai SD, Sopha SC, Fishman EK. Isolated duodenal duplication cyst presenting as a complex solid and cystic mass in the upper abdomen. J Radiol Case Rep 2013;7:32-7. Romeo E, Torroni F, Foschia F, De Angelis P, Caldaro T, Santi MR, et al. Surgery or endoscopy to treat duodenal duplications in children. J Pediatr Surg 2011;46:874-8. Yan X, Fan Y, Wang K, Zhang W, Song Y. Duodenal duplication manifested by abdominal pain and bowl obstruction in an adolescent: A case report. Int J Clin Exp Med 2015;8:21710-4. Byun J, Oh HM, Kim SH, Kim HY, Jung SE, Park KW, et al. Laparoscopic partial cystectomy with mucosal stripping of extraluminal duodenal duplication cysts. World J Gastroenterol 2014;20:1123-6. Rai BK, Zaman S, Mirza B, Hanif G, Sheikh A. Duodenal duplication cyst having ectopic gastric and pancreatic tissues. APSP J Case Rep 2012;3:15. Seeliger B, Piardi T, Marzano E, Mutter D, Marescaux J, Pessaux P, et al. 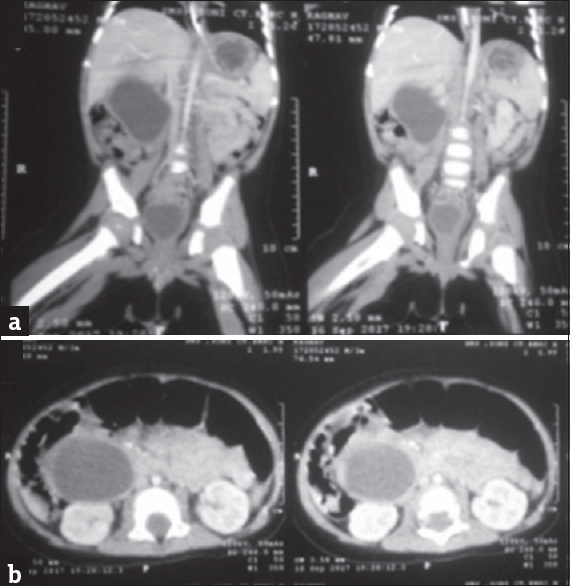 Duodenal duplication cyst: A potentially malignant disease. Ann Surg Oncol 2012;19:3753-4. Somme S, Langer JC. Duplications of the alimentary tract. In: Spitz L, Coran A, editors. Operative Pediatric Surgery. 7th ed. Boca Raton, FL: CRC Press; 2013. p 458-68.